Rainy days in Hawaii are almost a daily experience but so are double rainbows! With two hyper kids, a rainy day takes a lot of planning to keep the house and my sanity in tact. Here are a few easy activities with items you probably have around the house. Build a spider web in the corner of your living room using painters tape. Roll pieces of newspaper into balls. See how many balls the kids get to stick to the web in 30 seconds. Fill up your bath tub with water and add a drop of blue food coloring to set the scene. Add magnetic letters to the water as fish. Find a toy fishing pole and add a magnet to the end of the string. See who can get the most fish. Add other wildlife by adding magnets to shells, plastic animals even small plastic dolls. Cut a circle out of the middle of paper plates to create the rings. Have your kids decorate them using crayons, pens, glitter, stickers, anything you have around the house. Attach an empty paper towel roll onto a paper plate and set in the middle of the floor. 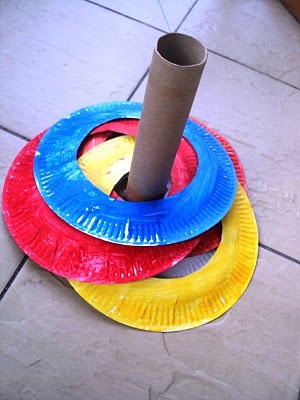 Your kids will have hours of fun trying to get the ring around the paper towel roll.